I was raised by a Mary-heart! And I’m such a Martha. This non-fiction gift edition spoke to my heart, whispered to me of “living room intimacy with God”, “fruitful living”, the wisdom and desirability of keeping God at the center of my busy life, how to work through the “Lazarus Moments” of life…I highly highly recommend it to you all, may it re-awaken your soul as it has mine. An invitation for every woman who’s ever felt she isn’t godly enough, isn’t loving enough, isn’t doing enough. The life of a woman today isn’t really all that different from that of Mary and Martha in the New Testament. Like Mary, you long to sit at the Lord’s feet…but the daily demands of a busy world just won’t leave you alone. Like Martha, you love Jesus and really want to serve him…yet you struggle with weariness, resentment, and feelings of inadequacy. Then comes Jesus, into the midst of your busy life, to extend the same invitation he issued long ago to the two sisters from Bethany. Tenderly, he invites you to choose “the better part”–a joyful life of intimacy with him that flows naturally into loving service. With her fresh approach to the familiar Bible story, Joanna Weaver shows how all of us–Marys and Marthas alike–can draw closer to our Lord: deepening our devotion, strengthening our service, and doing both with less stress and greater joy. 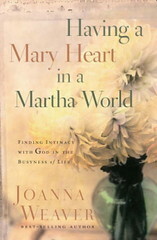 Joanna will be giving away 7 copies of Having a Mary Heart in a Martha World. All you have to do to enter is leave a comment on Joanna’s blog tour post. 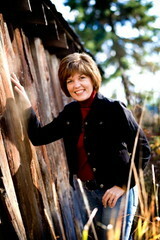 She is also giving away 7 copies of With This Ring, her latest release. To enter that contest, simply leave a comment on Joanna’s blog tour post (same link) telling her which chapter of Having a Mary Heart was your favorite and why. Fun and easy! Believe me, you’ll read this book and want to gift all your friends with a copy.